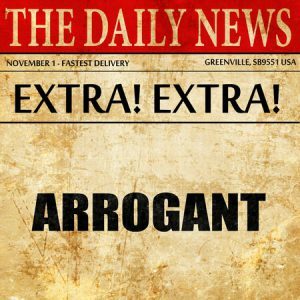 You are an arrogant leader? They put their needs before the needs of their people. They make irrational business decisions based on their emotions and how they feel not on sound business judgment. They take everything personal because everything is about them. They attempt to control everything and everyone. They believe that people are in their lives to serve them. They’re the first one to point the finger of blame and the last one to take ownership for their mistakes. Their actions are in-congruent with their words. They slow the development and growth of others so that they get ahead and stay on top. They talk big and play small. They play small because deep down inside they are small. The good news is that just like extraordinary leaders … the law of reciprocity prevails and so they always reap what they sow! Just be sure that you are putting out there what it is you want in return … respect … trust … honesty … etc. PreviousPrevious post:Change … an About-F.A.C.E.™NextNext post:Could This Be Your Best Year Ever?